The last time I’ve posted a coloring book review has been a year and a half ago! Wow, where did that time go…??? And it’s not that I didn’t buy any coloring books in the meantime, because I sure did (although not as many as before, I’m being more selective in which coloring books to buy or not). I just didn’t feel like it anymore. 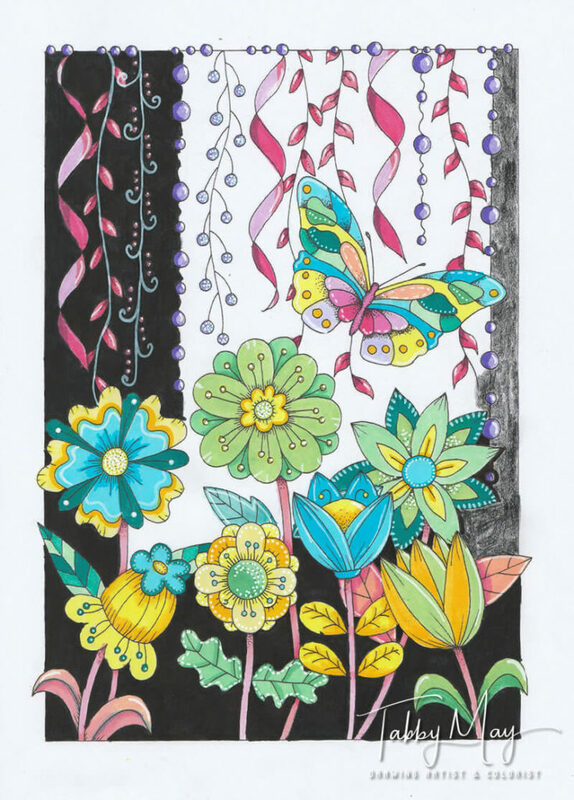 But now this new coloring book ‘Garden of Joy 2’ was released just a few weeks ago, and I couldn’t help myself. The moment I had it in my hands, I knew… I need to write a review about this book. The illustrator is Sabine van Ee from Sabine Design. Sabine has chosen to release this on her own through Amazon’s POD (printing on demand) service. Convenient for her is that she doesn’t need to buy a whole bunch of books from a publisher, with the risk of not getting rid of ’em. And there’s no editor telling what should or shouldn’t be done. For me as a buyer it guarantees that I can always get a copy. I buy a copy, and only then it gets printed. 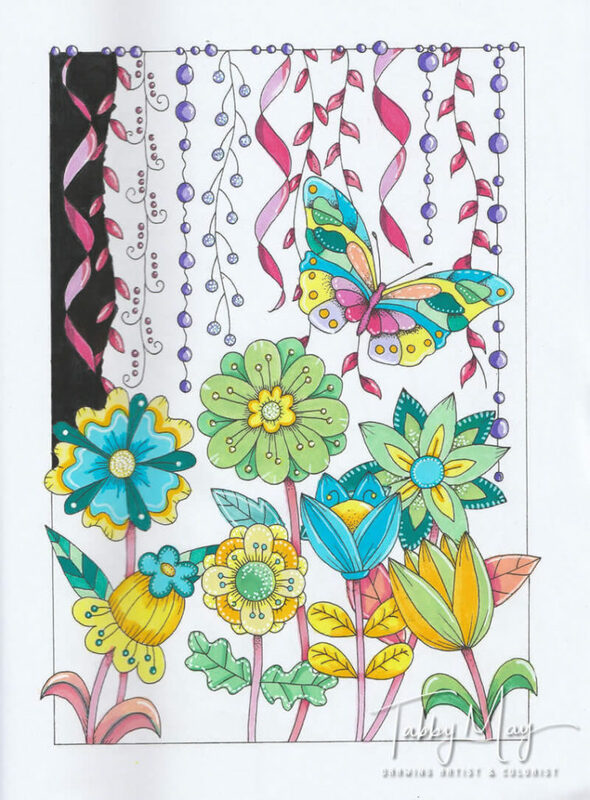 For my first coloring project from Garden of Joy 2 I started with the very first page. But before I’ll tell you about that and show you EXACTLY what I did, I’ll start with the second project I did haha. 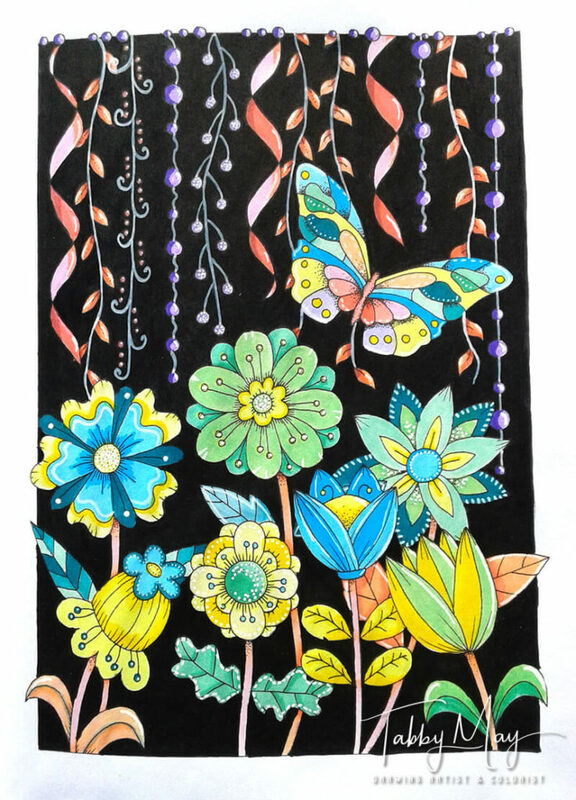 I chose a page with flowers, garlands and a butterfly. 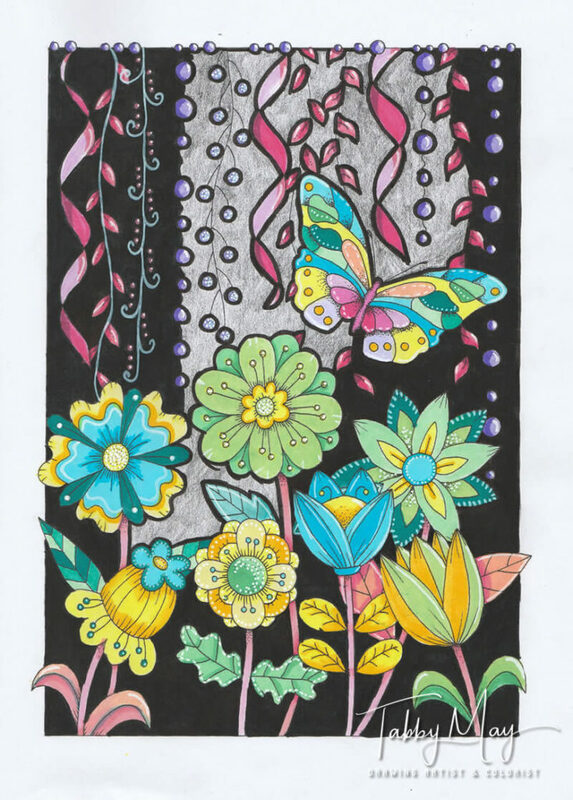 As my coloring medium I used my new Zig Clean Color pens. Ooooh are they lovely! I’ve always been a fan of the Tombow Dual Brush pens, but the Zigs are a real must have. And although they’re both brush pens, they’re also both totally different pens. The first corner was satisfactory (thank goodness!) so I continued with the rest of the background. I was glad that it worked out right, because I had totally forgotten to make a scan or take a picture from the result without the black! I went filling small parts at a time. And because the black lines became invisible, I had to draw them again. For that I’ve used the white Sharpie marker again, which you can see below in W.I.P.-pic 2. There was then just one thing left to do: drawing the lines of the garlands with the white Sharpie. Because I couldn’t see them anymore, I used W.I.P.-pic 1 as a reference, which was very handy. The final result pleases me very much, my blooming garden at night. Time for the real first project! Remember that I said that I started with the very first page of this coloring book? So now I’ll tell you what I did. Or to be more precise, I’ll SHOW you what I did. In the most literal sense! 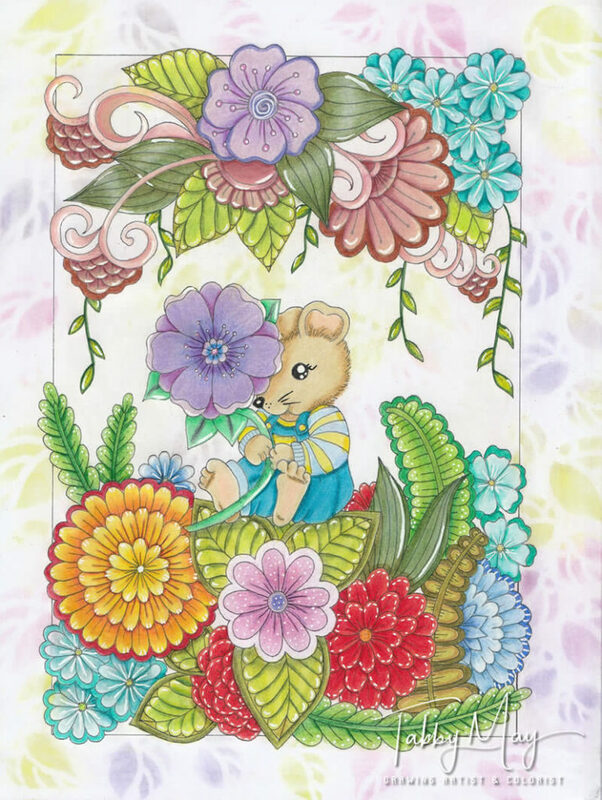 I called this colorized drawing my ‘Little Garden Mouse’. 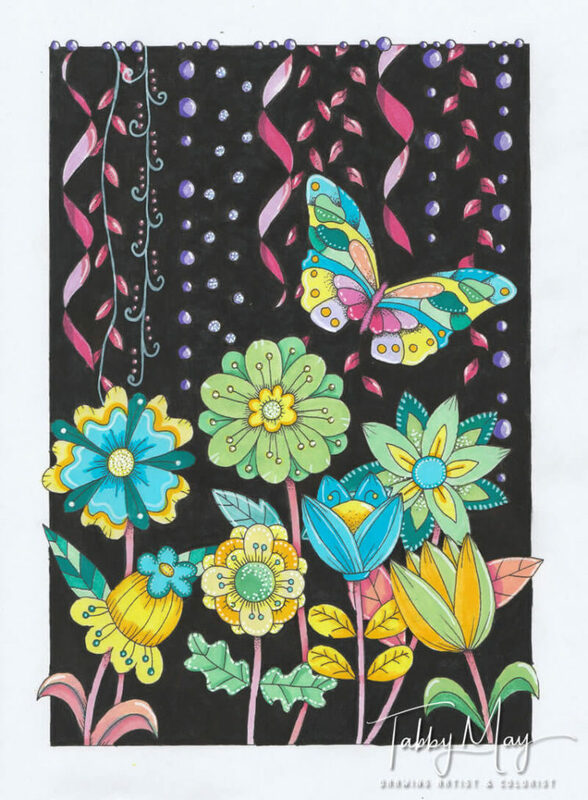 When I started I chose Staedtler Ergosoft colored pencils, but I found they were too hard and not suited for the paper. So after coloring a couple of leaves, I decided to switch to another brand. I chose the Prismacolor Premier pencils. They’re soft and creamy and just perfect for this paper. For the finishing touch, the background, I used a stencil from Studio Light (MASKMM18) and three colors PanPastel. And of course for the highlights the white Sharpie again. Oooooh… I’ve forgotten something! Have you noticed it too? In ‘Blooming at night’… While writing this blog/review, I suddenly saw it! So I’ll have to add it yet. Another riddle hahaha (I feel so dumb right now, why didn’t I see this earlier?) I’ll post the answer on my Facebook page soon, after I’ve fixed it and made another photograph in the sun (it’s late night at the moment of writing)! But go ahead and guess, or just tell me if you know, in the comments below 😀 . Alrighty then, where was I? Ah, I was about to show you what I’ve done to color this cutie, my Little Garden Mouse. Well, here goes then. Have fun watching and remember to share this review to Facebook and/or Twitter (buttons below ↓ ). And if you would like to have this coloring book yourself, just hop over to Amazon (after you’ve watched what I’m about to show you! 😉 ) and order it! It’s available on ALL Amazons! First off, I’d like to thank you for getting all the way to the end of this review (well, nearly, I’m not totally done yet hahaha). Do I need to say more about Garden of Joy 2? printed on demand, so you place your order on Amazon and it gets printed and you’ve got it in your hands real soon! 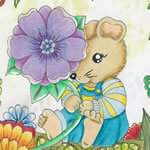 To wrap things up I’ll show you my Little Garden Mouse below. Ain’t it a cutie? * Remember this quote? Spoken by…? In the movie…? (I’ll give you one clue: the movie is from 1985…) How many of my three (sort of) riddles did you guess right? Give your answers in the comments below! I’m in no way affiliated with Amazon nor Sabine Design and I’ve bought this coloring book by myself. I can highly recommend this book and the first one, Garden of Joy. The illustrations are simply gorgeous and a delight to colour. I bought my copies from Sabine Design Etsy store so was able to print on quality paper. I can only say do yourself a favour and purchase these books – you won’t regret it. The little animals and gnomes are just so cute, and there is a great variety of flowers to turn into magnificent blooms. Ten out of ten in my opinion and definitely on the list of my top 10 favourite colouring books.